In what was a timely follow-up to my analysis of the Toronto Sun story published earlier this week, Rebecca Woolington of The Oregonian brings us a story profiling a San Diego police officer hosting a four-hour training session for fellow police officers in Oregon’s Washington County. The training is far from standard, as Brian Herritt will be instructing police officers on how to respond to autistic children. The father of an autistic child himself, Herritt’s inspiration began when his son eloped at the age of three and he found himself relying on police to find him. 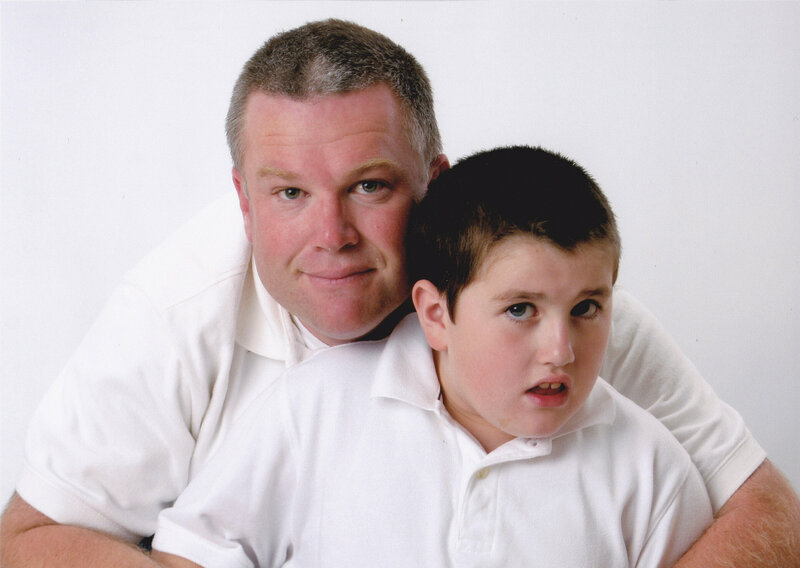 While his son was discovered safely, Herritt noticed police may be unprepared to handle autistic children, his experience as a parent and law enforcement official created a dedication to teaching cops how to recognize signs of autism and deescalate situations. Conversely, he also wants to teach parents the mentality of police officers. The Autism Society of Oregon is funding the training session, and one likely subject will be the potential of confusing symptoms of autism spectrum disorder (people talking to themselves or fixating on objects) with socially awkward behaviors that exhibit signs of drug and alcohol use. Herritt also explains how to best take autistic people into custody, what crimes they are most likely to commit or fall victim to, and to avoid assuming someone isn’t cooperating because they’re not responding to questions or orders (as explained many times on this site, some autistic people don’t communicate verbally). Autistic people must follow the laws like everyone else, but after the ordeal I dissected in Toronto, Herritt’s mission is the perfect antidote to solve issues surrounding lack of awareness of autism in law enforcement. One training session won’t make police experts, but because Herritt is a fellow officer with an autistic child, his ability to communicate to both parents and cops is more effective. He understands the wishes of parents to accommodate autism spectrum disorder when approached and the rapid responses officers must sometimes make on or off-duty. As I mentioned in the last story, there will be increasing encounters between autistic people and police officers as the autism population grows and ages, which likely means Herritt won’t be the only cop to offer this training in the future. There’s also a possibility of a follow-up story in The Oregonian as the training session doesn’t take place until next Wednesday, creating a set-up to report the response of attendants. Many are representatives of the sheriff’s office and local police departments in Oregon, so finding ties for the reading audience would not require much effort. Continuing to cover this story could also reveal Herritt’s future plans for these training sessions; the fact he is traveling to Oregon from the San Diego area brings forth the desire to promote a subset of knowledge to a group who most likely will need them on future assignments. Outside the region, other news editors and reporters may find citizens similar to Herritt who share his goal. Woolington spends the first half of the story explaining Herritt’s background and his drive to educate other officers before switching to local sources for their reaction regarding his Oregon visit. Woolington indirectly highlights why autism training will matter to any kind of safety official in the long-term: parents already in the business are getting a first-hand experience with the disability. I always stress that autism itself cannot kill its inhabitants directly, but the stress and frustration that builds with raising children on the spectrum can lead caregivers to murder, as was the case with Margaret Jensvold, who killed her 13-year-old autistic son and then herself in a story published by Eric Tucker of the Associated Press and syndicated to Huffington Post. A dark irony in this instance was Jensvold’s occupation of a psychiatrist. Police found a note along with their bodies earlier this month, with Jensvold saying she couldn’t deal with the Maryland school system and that debt was strangling her. Family members said Jensvold was increasingly strained by financial pressure and fights with the Montgomery County public school system as they refused to cover tuition costs for Ben Barnhard to attend a private school for special-needs students. Jensvold didn’t want to return her son to a public school district where family members said she felt harshly judged and marginalized while Ben had struggled. The note added that Jensvold killed her son so he wouldn’t experience of the trauma of losing her mother, with Jensvold’s sister noting she wouldn’t believe Barnhard would mentally recover from such an event. Barnhard spent nine months at a weight-loss boarding school after he topped the scales at 275 pounds, and he dropped more than 100 pounds when he finished his time there, gaining new-found optimism about school and being a kid again. The day after Jensvold killed herself and Barnhard, a check came in the mail from her sister’s mother for $10,000 toward tuition at the private school she was hoping to enroll Barnhard in. This is the third article I have dissected on my blog where an autistic child was killed by his or her parents, and recurring themes are all too similar: parents are unable to handle the challenges of raising children whose development doesn’t align with neurotypical kids, with their emotional stress exacerbated by the feeling of isolation from the community. Unfortunately, this leads parents whose conflict management skills are vulnerable to taking the life of the children they gave birth to. Imagine how Jensvold’s circumstances could have changed had she not become mentally unstable and held out for at least an extra day, where she would have learned that support was coming for her son. Covering a story like this is not much easier than it was for the sources to speak about what happened (Jensvold’s sister and Barnhard’s father were interviewed). Since Tucker is an Associated Press employee, his story follows a specific format that’s about as hard-core as you can get with journalism. Opinions from authors of AP articles are non-existent, and since AP stories are often distributed throughout news outlets across the country, their writers will craft the story for a national audience as they cannot predict where and when their stories will appear online or in print. Even with the guidelines, there still is room for some creative flow in AP stories, as Tucker leads with Ben’s achievement at the weight-loss boarding school he attended after enduring years of taunting from classmates. Similar to the mission plan of the Syfy series Alphas, Tucker sought to communicate qualities to the audience that highlight how Ben’s previous weight problems and autism spectrum disorder had little effect on his interests or capacity for autism. Midway through the story, he does the same for his mother. While it won’t change the fact that Ben’s mother ultimately killed him, Tucker does his part to humanize the story’s subjects to increase audience accessibility. Instances of parents killing autistic children are rare, but the emotional weight of murder often means such deaths will likely find their way to online media. Autistic children shouldn’t live in fear of being killed by their parents, but Tucker explains through his reporting why murder/suicide is a poor solution. Tucker and the Associated Press won’t make a call to action themselves, but perhaps readers who know of parents traveling through an environment similar to Jensvold’s will pick up the cue. 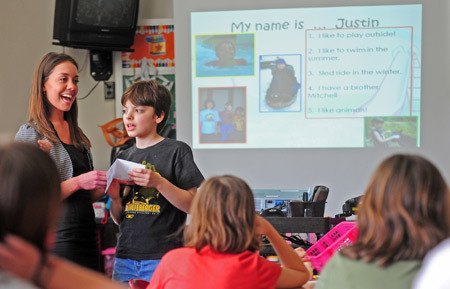 Justin Evans, with assistance from an autism aide at Colfax Elementary School, highlights his shared interests with non-autistic classmates during a presentation. Photo by Jason Bridge. OK, so adults still teach full-time, but Michael Aubele of Valley News Dispatch found three autistic students at Colfax Upper Elementary School who shared their autism spectrum disorder with their classmates. The school, along with other school districts in the Alle-Kiski Valley in Pennsylvania, are involved in sponsoring events for Autism Awareness Month, which wraps up this Saturday. The three autistic Colfax classmates, just like almost every other student, were nervous about their presentations because their lectures broke traditional routines (autistics are very routine-oriented). One student used an iPad to showcase his interest in Dr. Seuss, and his autism support teachers regularly use the iPad to communicate with him. Their fellow classmates embraced the learning lessons because they increased their overall understanding of autism spectrum disorder. One student interviewed by Aubele said she wasn’t aware of autism’s range of severity prior to the presentations. Aubele’s story is short and doesn’t quote any sentences when he refers to his interviews, but give him credit for finding a pair of fellow students to gauge reaction to the information shared by their autistic classmates. Interviewing children is tougher than adults and even teens who are subjects of many other autism stories, so not seeing many quotes from them isn’t a surprise, no matter what restrictions were placed on story length. Complicating such an interview is the story’s subject; adults have spent hours upon hours and are still dumbfounded on many facets of autism. Now throw in a much younger face with much growing to do. Fortunately, as Aubele shows, no hairs need pulling when approaching kids for interviews. Stick to the simple questions, such as what they knew before and after a presentation and what they thought about it. Although surmising a deadline for this story isn’t achievable, Aubele could have played up his third-person narrative with the autistic students and their classmates to a greater extent. How much did the autistic classmates believe their peers understood their disability? What goals did they have for the presentations? How well did they get along with classmates before they opened themselves up in this fashion? The story’s short length doesn’t allow much development for such ideas. However, Aubele’s story illustrates the reduced fear of sharing sensitive material about students that can increase their vulnerability. The mentality when I attended elementary school was silence in hopes that no one would think the disability exists. Unfortunately, autism and other disabilities don’t work that way. Gauging what would be different had I attended in this social environment is impossible due to too many changing variables, but Aubele’s piece could ease worries other parents or teachers may still have about revealing differences. Wendy Givens brings Madison to school. Photo by Michal Thompson. FOX affiliate KPTV in Portland recently published a story about an autism service dog who found himself at the center of an experiment. Jordan Givens, a 10-year-old autistic fourth-grader, has started bringing his service dog, a German shepherd named Madison, to Patterson Elementary School in Hillsboro. Although the Hillsboro School District originally disallowed Madison to sit with Jordan in class because they said Jordan was adequately achieving his goals in his individual education plan, they are now allowing Madison in Jordan’s classes to find out if the German shepherd helps Jordan function more effectively in school. Wendy Givens, Jordan’s mother, already believes Madison is a metaphorical portal. She says Madison is trained in behavior disruption, which means he helps Jordan’s bouts with aggressions and calms his senses. The school’s principal says Jordan’s teacher is considering the dog’s effect on other students, adding that his classmates appear prepared to adapt Madison into their routine. The experiment also has the support of the U.S. Attorney in Oregon. The story points out the continuing efforts to spread autism awareness throughout all communities. 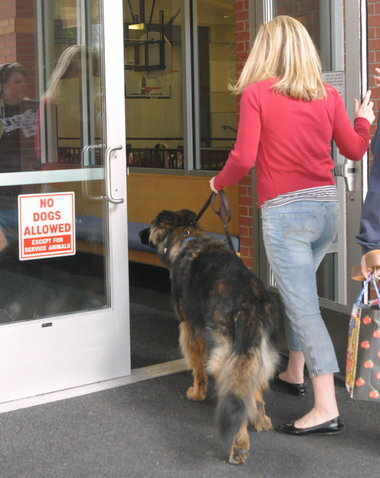 Normally, dogs aren’t allowed on school grounds unless there are mitigating circumstances. Usually, such circumstances involve physical disabilities, which autism is not. Recall that the disorder can be difficult to detect with the naked eye, so even if Jordan’s school district is aware of his condition, there’s a possibility the school district may not see what’s wrong with him, and that may have caused the small ordeal about allowing Madison in school. Madison has served as the Givens’ service dog for three years, although we aren’t told much about the shepherd’s impact with Jordan. The story’s focus was why the dog wasn’t allowed in school, so it’s not surprising that little information about the bond between Madison and Jordan is divulged. TV news stories have short windows for stories, so unless they’re airing a longer feature, broadcast reporters can’t spend much time on topics related to but not about the primary theme. Depending on who comes across this story, Madison may not be just the center of a local experiment, but a regional or perhaps national one. Approaching autistic students still leaves school officials and parents scratching their heads because of low data for accommodations outside of special education classes. The development between Madison, Jordan and his classmates could provide some insight on the success of additional resources. After The Autistic Journalist recorded its biggest month in web traffic since the site was launched (over 900. Not a ton, but 300 above the previous mark set in April this year), activity keeps rolling for the month of October. A family is upset at felony charges filed against of their 11-year-old autistic boy in the Florida panhandle, claiming the school he attends used him as an example to avoid cuts for school resource deputies. The boy, Terrauce Jones, allegedly struck an assistant principal with a binder after becoming upset about allegations of hitting another student. He then went to the prinicpal’s office, attempting to kick her after she tried to calm him down, then threw a soda bottle at her direction a short time later. The family questioned the decision-making, wondering why there was no attempt to restrain Jones by putting him in a room until the family showed up, while the school district contends every effort was exhausted before calling in law enforcement. 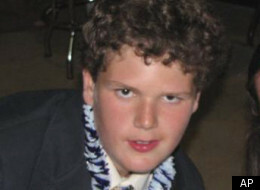 Jones’ autism has been controlled through medication and supervision since he was diagnosed at age 2. His family approached the school about home schooling Jones because of difficulties transitioning to middle school, being around more students, and bullying. School officials said he was too smart and accommodations would be made, and his medications were adjusted. Jones’ family said he suffered an outburst this week because he was low on medication. There are some parallels here to the story I discussed about a North Carolina restaurant, where two sides speak on an issue. What’s different is the school district providing their side of the story while the other side believes the decisions made in the incident could have been chosen more deftly. This story marks the second time a news outlet has reported felony charges against autistic children since I launched the site, and both times, the charges were a result of mental outbursts that quickly turned physical. Such emotional reactions are no surprise in the autism community, but the inability to predict an autistic person’s mental volatility will create a possibility of an outburst. I’m not sure how charging autistic kids with felonies will help, although school districts cannot give autistic students a free pass either. It’s worth noting that the deputy who arrested Jones didn’t know about his autism until after the fact, and he said he would have supervised him until his family arrived had he known in advance. The catalyst lies with mainstreaming autistic children in educational environments. The strategy is not a poor one, especially if an autistic child has no learning difficulties or superior skills in some cases (thank you Wheel of Fortune :-P). However, side effects follow, including the problems I listed above. Other children generally aren’t aware of autism and its symptoms, and the lack of understanding can contribute to social problems on both sides. Regarding coverage, there are several ways to handle a crime story. When a mental disability is factored in, the focus generally shifts to a story about a potential lack of understanding without addressing the larger issue of an increasing population of autistic people and those with other mental disabilities. There’s little coverage on the estimated growth of autistic people in the years to come, while news outlets frequently cover the future’s potential problems with a growing overall population. However, felonies charged against autistic children are not established patterns and will stand out in the news because of their rarity. Journalists may want to explore the facet of autistic students in mainstream classrooms and examine how classmates can better understand why others are different and cannot control those factors. Not all children are bullies, and even knowledge may not change behaviors of those looking to make trouble, but there are ways to explain all disabilities to children in ways they can grasp, even if they do not fully understand. Autism is heating up in Australia, and not because the country is transitioning to its summer period. A 17-year-old student is suing the Education Department for discrimination because he claims his teacher refused to re-word math questions on tests. The student, Lewis Walton, said his math scores dropped because test questions were open-ended that related to real-life situations. He said he struggled with those questions and became so anxious that he was almost admitted to a hospital. The school did not comment in the story, but meeting minutes reported that the tests in question did not present any language difficulties. While the story is another example of “he said/she said,” where the story is comprised of mostly claims, there are a few twists. Autistic people are not known for lying as most have difficulty comprehending complexities with language, including exaggerations and “white lies.” To have an autistic person take sarcasm or exaggeration literally is not a surprise, finding comfort with logically-based communication (for those who can communicate orally). However, the reporter did not present any proof beyond Walton’s testimony in the story, so the extent of the alleged discrimination is truly unknown. So what makes this story intriguing compared to my last post? This was a story in Australia covered by an Australian news outlet. While access to international journalism is well-known for news junkies and web surfers, a close study can make an effective comparison to domestic coverage. The school lawsuit story provides an example that adaptation for autistic people can be problematic anywhere in the world, despite the majority of stories coming from the United States and United Kingdom. While not frequent, Australia contributes to the autism news front, and I’m sure further examination would quickly reveal autism issues in countries where English is not the primary language. While parents will often question their own abilities when they discover autism in the family, this story may help them understand that the condition is global. Closer examinations of autism’s international saturation may highlight tips, parallels, strategies, questions and topics that may not be discussed within the states. Autism’s biggest controversy, the suggestion that vaccines caused the condition, started in the United Kingdom. AOL occasionally highlights articles originally published for its Spanish-speaking audience. 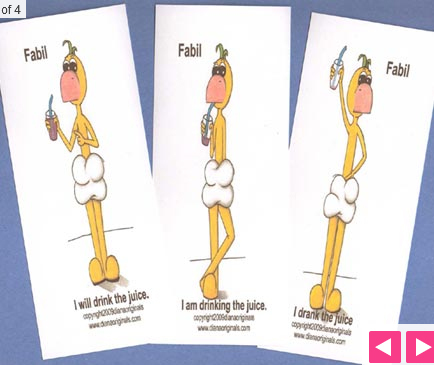 One of them was a profile piece on Diana Trevino-Wilson, whose expertise in graphic design led to a series of flash cards called Fabil Teaches. Available for parents of any language, the goal is to help children understand prepositions, tenses, pronouns and feelings (some highlighted in the picture). Fabil was originally created in 1990, but Diana used the character to help her autistic daughter understand things most parents take for granted with neurotypical children (although they too can benefit from Fabil Teaches as the article indirectly demonstrates). Diana also accepts special requests for cards when the normal set is either too advanced or too simple. From a journalistic perspective, this is simply a profile piece about a mother of an autistic child who found a way to help her daughter adapt to the modern world. But there are two bits of information that demonstrate ways autism transcends what you might read in mainstream news sites (traditional newspapers and television broadcasts). The first is the publication site of this story, designed for the Spanish-speaking audience, particularly the Latin-American population that resides in the country. With the group providing the fastest population growth due to mass immigration, it’s only logical to expect a rise of autism in communities whose roots lie in Central America. The story defeats the stereotypical portrayal of autism only affecting European-Americans, something we shouldn’t assume as whites slowly shift to a minority status in the United States. Second, the writer found a story within a story that tells the audience how a cartoon character helps autistic children express their thoughts in an appropriate manner also helps other children do the same, regardless of their mental state. Give credit to the reporter for considering the audience while keeping the focus on autism. The audience is a very important factor when crafting stories. You don’t have to submit to their every request (no two viewers/readers will agree on everything a reporter should do in a story), but you’ll get their attention if you find a potential impact one person can make. Few people reading the story will have an autistic relative. The writer also considered the audience when crafting the lead, which continues the shift I’ve seen in autism articles that abandon clinical definitions to focus on developing stories. We still understand its effects by using Diana’s personal endeavors of learning about her daughter’s autism diagnosis and how that could affect her development. The article provides evidence that autism will continue to integrate with communities as a whole and, unlike race relations, cannot be separated to deflect the problem. However, Diana’s Fabil is one way autism can teach all of us about typical child development; that even the most normal of kids will accomplish learning milestones in various ways and various times.